Recent release “Please Don’t Break An Angel's Heart” from Page Publishing author Faith Ford is a reminder of the values and treasures life has to offer. Faith Ford, a devoted writer and lover of life, has completed her new book, “Please Don’t Break An Angel's Heart”: a heart-warming journey of a boy who touches the lives of all around him. Published by New York City-based Page Publishing, Faith Ford’s moving tale touches all who read it. The story teaches its readers how valuable life is and how important love is that endures. This book is fiction and intended by the author to express her views on the value of life. This story is about a very talented teenage boy who starts out on a journey to find someone who will treasure him and adore him with fatherly love. He faces many perils along his way, as well as joy, laughter, and tears—accidentally changing the hearts of those around him, teaching them enduring love. "Please Don’t Break an Angel’s Heart" will take the reader through the adventures they each encountered as they strove to reunite. The author suggests that readers buy a box of tissues— make that three. She sincerely hopes everyone will enjoy this story. 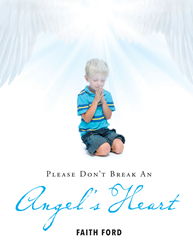 Readers who wish to experience this inspiring work can purchase “Please Don’t Break An Angel's Heart” at bookstores everywhere, or online at the Apple iTunes store, Amazon, Google Play or Barnes and Noble.